Hello there! It’s me again, Katie from The Casual Craftlte. Today I am sharing a homemade idea for the holidays. 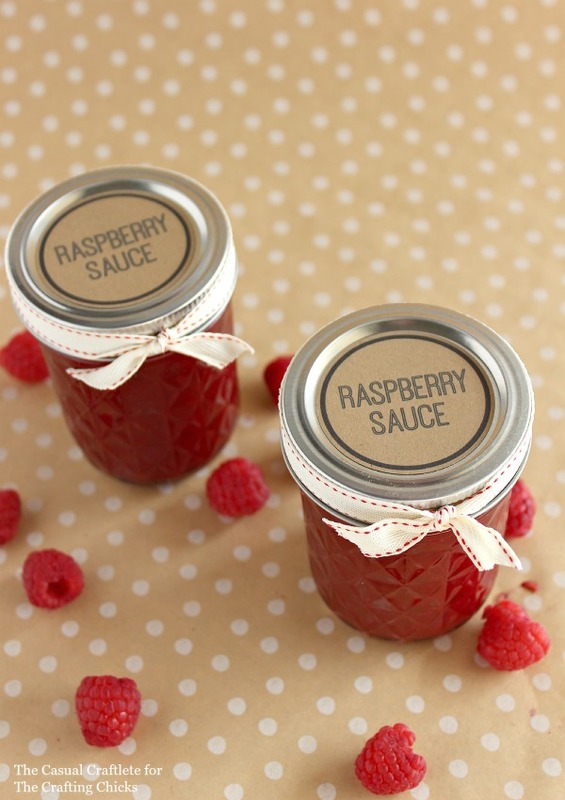 This Raspberry Sauce DIY Gift is perfect for topping cheesecake, ice cream, yogurt and more. Plus, I have included labels which you can print later in this post. 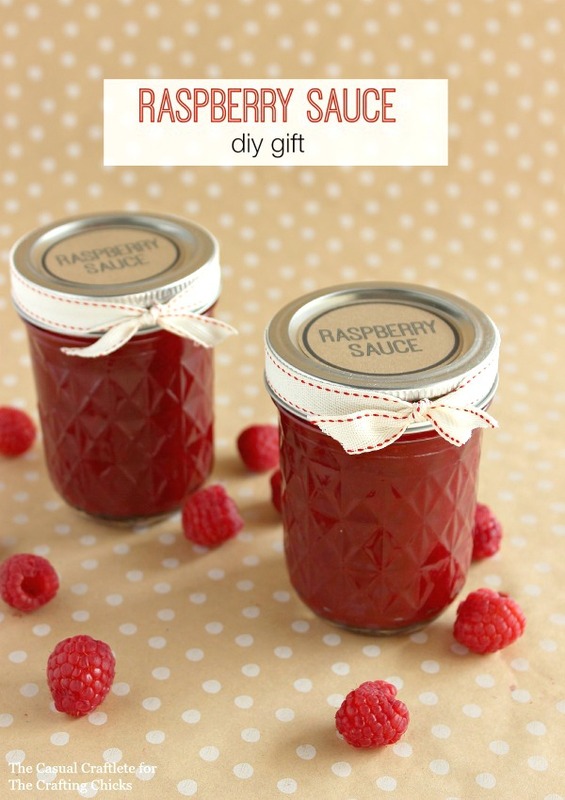 I love the idea of making raspberry sauce for Christmas. It says “Happy Holidays” with it’s vibrant red color. The recipe I used makes approximately 6 oz, which is the exact size of mason jars I bought. In a medium sauce pan on the stove, combine 2 1/2 teaspoons cornstarch, 3 tablespoons granulated sugar and 1/3 cup water. Add 12 oz of thawed raspberries and cook over medium heat. Stir constantly until the mixture boils, mashing the raspberry with the back of a spoon. Once the mixture is boiling, cook and stir for one additional minute. Strain the sauce through a fine mesh sieve placed over a bowl to remove seeds. The sauce can be served warm or cold. Store in the refrigerator. 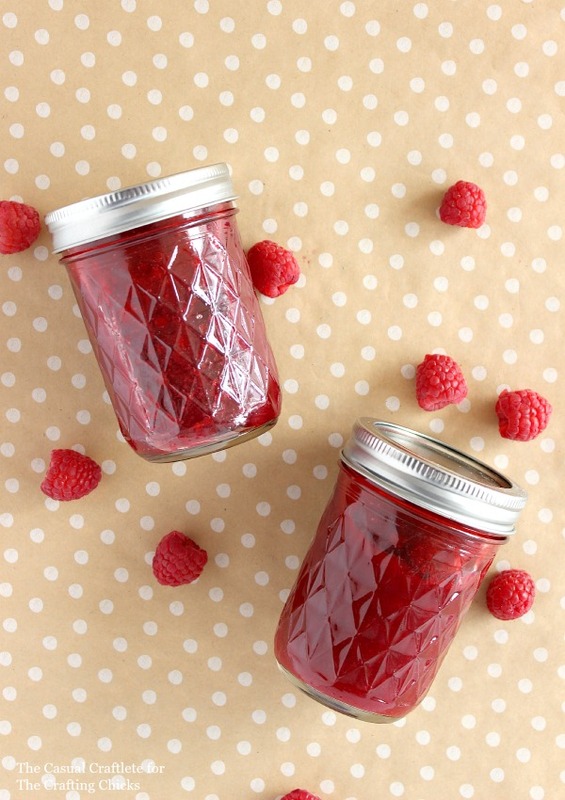 *Make sure to sterilize your jars before adding the raspberry sauce. I wanted to make some labels for the tops of the jar lids. I recommend printing the labels on brown kraft paper. I just like the rustic kraft look. The labels are 2 inches. Just cut or punch each label. I used adhesive tape to secure the labels to the tops of the lids. 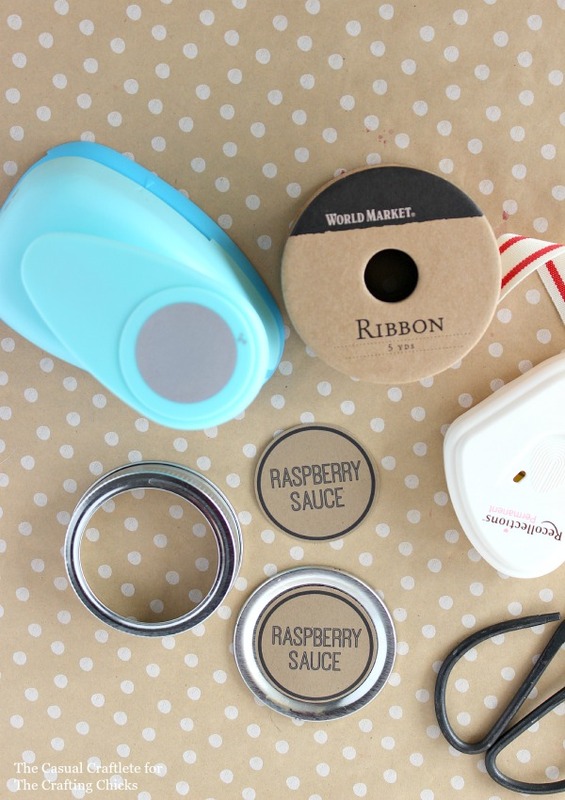 Then I tied a cute ribbon around the rim of the lids to finish this diy gift. In a medium sauce pan on the stove, combine 2½ teaspoons cornstarch, 3 tablespoons granulated sugar and ⅓ cup water. Add 12 oz of thawed raspberries and cook over medium heat. Stir constantly until the mixture boils, mashing the raspberry with the back of a spoon. Once the mixture is boiling, cook and stir for one additional minute. Strain the sauce through a fine mesh sieve placed over a bowl to remove seeds. The sauce can be served warm or cold. Store in the refrigerator. Hope you all have a MERRY CHRISTMAS and HAPPY HOLIDAYS! Thank You for the jam recipes as well as the printable labels. Now, if only I had some ice cream but then again, this would also be good on waffles / pancakes or even over a slice of pound cake. How many jars does this recipe make? Thank you.